Steve Bannon at the White House on April 20. 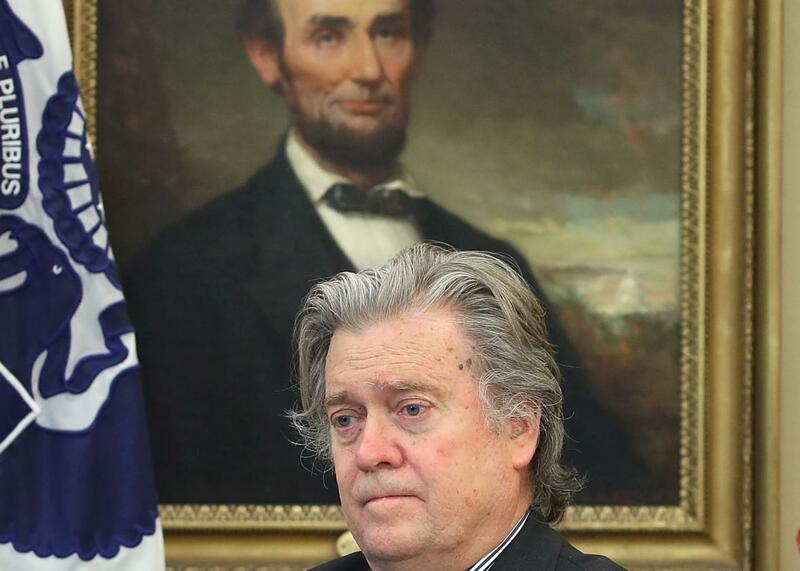 Let’s just assume that “Steve Bannon no longer works at the White House” is an appropriate takeaway from all that given that rumors of his imminent departure had been reported by Axios earlier Friday. The Axios report and a just-published New York Times article list a number of reasons why Bannon has lost favor with Trump: He argues too much with National Security Adviser H.R. McMaster, he maintains a high profile in the media that makes Trump jealous, he advocates a populist economic policy that’s at odds with the trickle-down conservatism of other advisers, Jared Kushner thinks he’s too much of a hard-liner, and so forth. You’ll note that nowhere among those reasons are “he’s the country’s leading enabler of the white supremacist movement,” but that’s Trump for you. In any case, the white supremacists will now have to make do with the 1 billion other connections they have to the administration. Gabriel Sherman of New York magazine reports that Bannon is expected to return to Breitbart. You haven’t heard the last from Steve Bannon (about what crimes immigrants and black people are doing), America!